Nelvana of the Northern Lights--created, written, and illustrated by Adrian Dingle*---first appeared in the August 1941 issue of Triumph comics. She became Canada's first national super hero, preceding Johnny Canuck by six months. Stories that the Group of Seven Canadian painter Franz Johnston brought back with him from the Arctic inspired Dingle to create Nelvana, a goddess who lived among the Eskimos and who could travel at the speed of light along a ray of the Northern Lights. Dingle softened the gruesome character of legend, dressing her in a short, ruffled dress, regal crown, flowing cape, and knee-high boots. 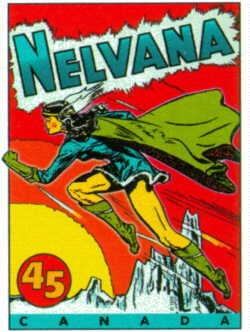 Nelvana, one of the Canadian Whites, predated Wonder Woman. She fought the Axis Powers, super villains, spies, and other wartime wrongdoers. As a true Canadian hero, Nelvana also helped her native people. In one adventure she joined forces with her brother Tanero to rid the country of an evil force that was stealing fish from the northern waters. Her superhuman powers allowed her to become invisible in times of danger by being absorbed in her father's rays of the Northern Lights. Nelvana's final appearance came in May 1947. *In the original article the gentleman's name was spelled Dingwell. I have been informed the correct spelling is Dingle.